It doesn’t take tens of thousands of dollars to make your kitchen look bright and new again. There are many upgrades that can transform the look of your interior without breaking your budget. In fact, kitchen cabinet refinishing is one way to achieve just that. 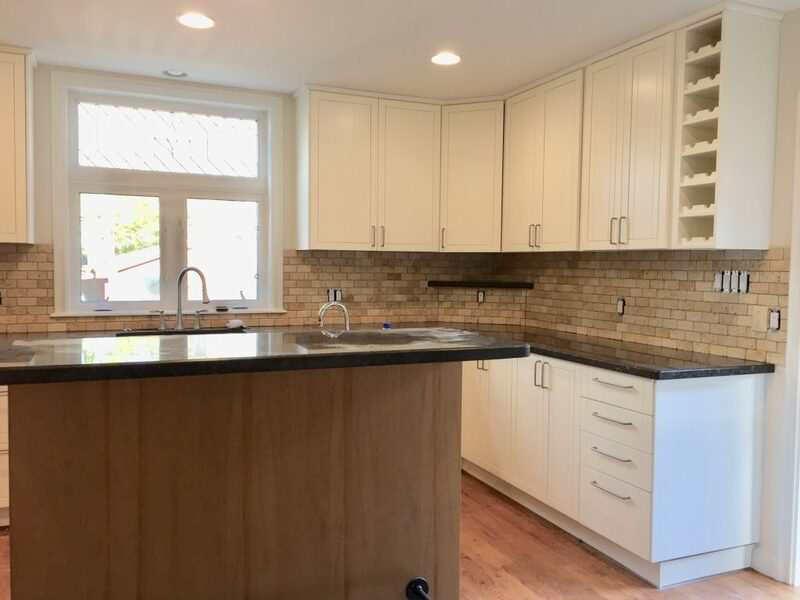 Hiring proven professionals for your kitchen cabinet and furniture refinishing project can turn your old, dull cabinets into fresh, modern cabinets that are the focal point of your kitchen and your home. Here are some ways you can make your old cabinets look brand new again! If you walk into your kitchen and the atmosphere is gloomy, it’s probably because you need a new, fresh and updated look. Dark cabinetry, backsplash, and table tops are out of style and take a lot of the light out of the room. The good news is that if your cabinets are in good condition, you can have them repainted with a fresh coat of lacquer that is brighter and brings life to the space. Kitchen cabinet painting is an affordable way to bring excitement and beauty to your home without enduring the cost of a full-scale kitchen remodelling. There’s something missing in most Canadian kitchens and believe it or not, it’s not a very expensive item. It is simply good lighting. There are many ways for you to brighten the space where you probably spend most of your mornings and evenings. Installing undercabinet valence lighting and trim can not only make cooking and prepping a lot easier, but it’s also a great way to highlight your beautiful backsplash and the countertop in your kitchen! Crown moulding is mounted on a hardwood frame that sits above the cabinets. This beautiful feature is a great way to create additional stylish height and add luxurious taste and style. Cabinet trim(s) help transform your kitchen storage into a seamless design that adds extra personality. Adding simple trim, moulding pieces or wainscotting to gables, doors or plain panels can add simple, inexpensive improvements to modernize the look of your kitchen. Giving your kitchen a makeover is all about the little details. Newly painted cabinetry along with simple changes to your hardware (new door knobs or door handles) creates a simple, yet amazing transformation to the look of your kitchen. Another important, but often overlooked detail that can improve your kitchen cabinet function is the type of hinges you use. A great number of homeowners are replacing their old hinges that slam shut with new, modern “soft close” hinges. A simple, cost-effective improvement that can be accomplished very quickly. If you’re looking to give your kitchen a fantastic new look without the steep price tag, refinishing your cabinets is the best option! At Booth7, our team has the right training, experience, and materials to refinish your kitchen cabinets and provide expert advice to transform your existing cabinets from drab to fab. We have a state-of-the-art facility that includes a professional closed spray paint booth with superior ventilation and equipped with everything necessary to complete your project. Have small children and/or pets and you are worried about lingering paint smell and breathing in hazardous paint fumes? Don’t be…with Booth7, you won’t have that problem. In fact, we’ve never had a single complaint about lingering paint smell during or after a refinishing project. To get started on your kitchen renovation and have your cabinets painted, give us a call today. We should return your call immediately, but if not, it’s always within a few hours! Have an idea of what you want your kitchen to look like? Send us a photo of your existing kitchen and get a free consultation and estimate. We are available seven days a week to answer your inquiries and ensure your kitchen cabinet refinishing project is as smooth as possible. For more information about our services, please fill out our online form or contact us at info@booth7.com.